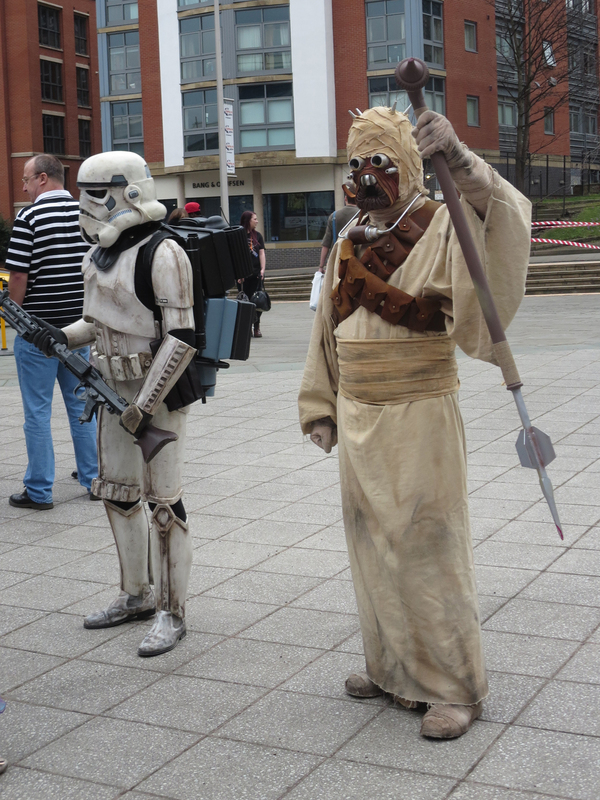 Science fiction, once the preserve of spotty and socially awkward star trekkies has seemingly stirred my nostalgic sci-fi senses, so I set my phasers to fun and find myself attending EM-Con 2015 – The East Midlands Sci-Fi & Fantasy convention. Getting here hasn’t been easy, kind of badly going where sci-fi fans have been before, anyone who drives on Nottingham’s ring road knows it’s a Mad Max style battle for survival. By Grabthar’s hammer, what a sci-fi & fantasy convention. Greeted outside by Mr Stay Puft the giant marshmallow man from Ghostbusters, he’s been tied down, probably to stop him from causing any more damage to the building as evidenced by the scaffolding behind him to repair it. Passing through the hallowed entrance of the Nottingham Ice Arena, like Dave Bowman as he entered the Monolith, my god its full of stars, science fiction stars that is. It’s also full of geeks, hundreds of ’em and some them you wouldn’t want to touch with the torch of Gondor. By Grabthar’s hammer though, it’s already looking better than last year’s EM-Con event, there’s room to breathe for a start and unlike last year, the organisers haven’t made the mistake of assuming the venue had TARDIS like capabilities. This time it’s bigger on the inside than it is on the outside. 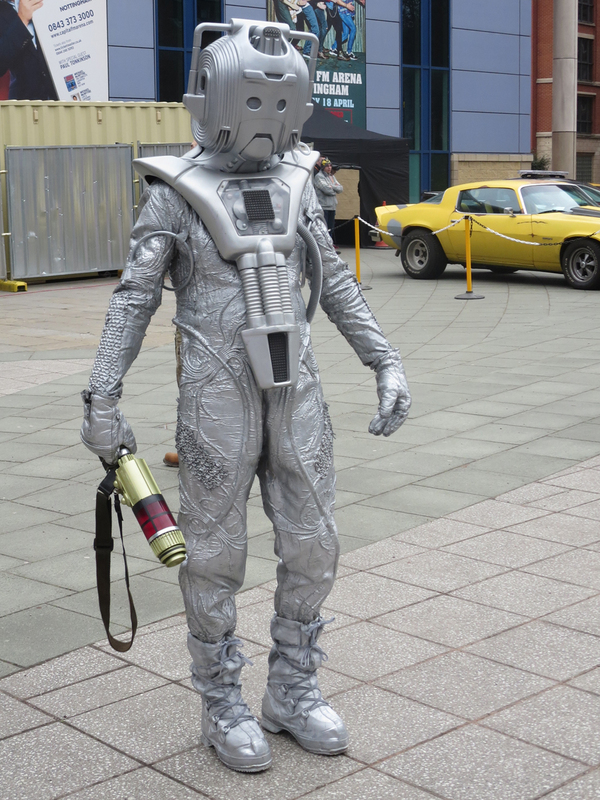 A very depressed looking Cybermen at EM-Con. Nice onsie jumpsuit mate, very 80’s. Inside, a panel of sci-fi stars are paraded and pilloried, Hogwarts and all, in mockumentary Galaxy Quest style line up. Quite a few guests here, I walk to find Jemma Redgrave draped over a desk. Crikey, I’ve only just got here, she must have heard about me already. She’s accompanied by quite a few other Dr Who cast members, including Peter Davidson, Colin Baker and Sylvester McCoy. Thankfully, these gentleman weren’t draped over the desks. There’s also Nicola Bryant who played the enormously bosomed Dr Who assistant Peri Brown. Let’s just say that as a young lad growing up in the 70’s and 80’s, that some Dr Who assistants will stay in the memory for a long time. 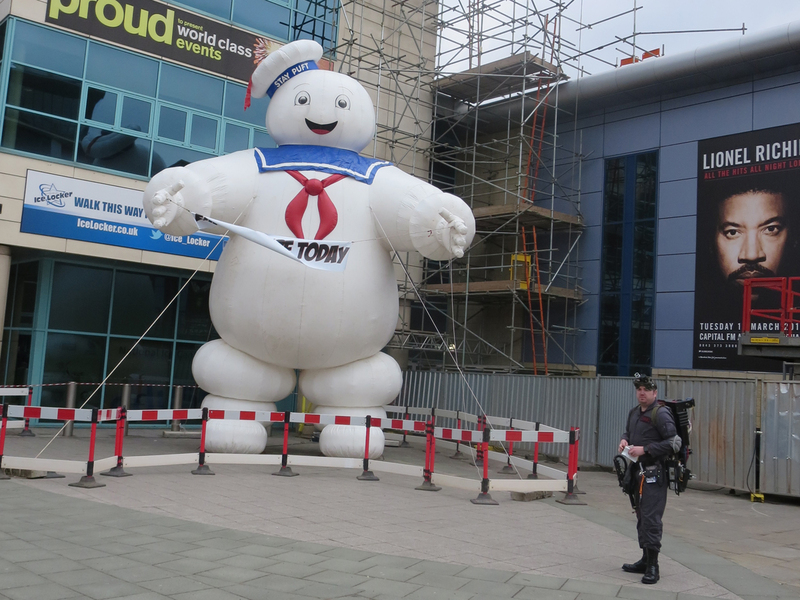 Mr Stay Puft, the Marshmallow Man from Ghostbusters wreaks havoc in Nottingham. The Red Dwarf crew are back, a load of Game Of Thrones people including James Cosmo, who has been in everything, who played Jeor Mormont the Lord Commander of the Night’s Watch, Ron Donachie played House Stark Master At Arms Rodrik Cassel before Theon Greyjoy lopped his head off, good to see them looking after Shireen and Myrcella Baratheon. Also here is the actor who played Greedo, fresh in from Mos Eisley Cantina, who appears to have survived his blaster shot from Han Solo. Dark Lord of the Sith, Darth Vader in the form of Dave Prowse sits quietly, probably planning the demise of the Jedi fanboys walking around. Looking menacing drinking from a polystyrene cup is Wolf Kahler, he played the Nazi stooge scumbag Colonel Dietrich in Raiders of the Lost Ark. Looking very attractive is Atlantis and The Pillars of the Earth actress Sarah Parish. It’s dizzying when you mix with the stars, so I head to the dealer’s tables. Given the prices some are charging, I’ve no doubt they will definitely live long and prosper, laughing all the way to the Iron Bank. Undoubtedly, the biggest star here is Nichelle Nichols who played the chief communications officer aboard USS Enterprise as Lieutenant Uhura in Star Trek. 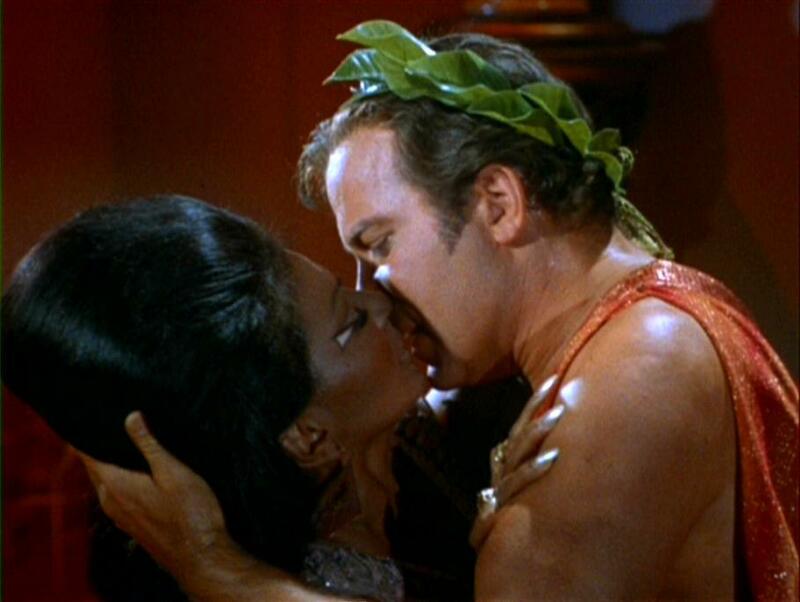 Her most famous scene, going where no one on TV had gone before in an episode titled Plato’s Children, where Captain Kirk and Uhura kiss, the first interracial kiss on US TV. With that TV taboo trampled on, the floodgates opened, Charlton Heston taking it that one bit further a year later when he snogged Zera the scientist chimp in Planet Of The Apes. Interracial, interspecies and interplanetary erotica, whatever next, the Prime Minister shagging a pig? Oh wait…. Whatever floats your boat I suppose, I don’t judge. Uhura and Captain Kirk kiss. Clearly she cannot resist his manly charms. The first interracial kiss on US TV. It’s a good job the security is here, Stormtroopers no less, to keep the Rebel Alliance lot in quiet order. It seems to be working as well, Sand People Tusken Raiders, Bounty Hunters, Wookies, Ewoks, Daleks, Cybermen, Jedi and Rebel scum are all here jostling for control of the planet. Somebody’s gotta keep ’em in order. But even after all the stressors of universal conquest initiatives of destroying without pity and attacking without fear, it’s nice to see the Dalek do-gooders collecting cash for charity, even if it is a ray gunpoint. Misunderstood creatures… After a hard days interplanetary conquest, Dalek do-gooders collecting cash for charity. Jemma Redgrave draped over a desk. The Rebel Alliance and religious Jedi zealots stand around making plans to blow up space stations and use teddy bears as cannon fodder. Security provided courtesy of The Empire. Feeling rebellious and facing fanboy rage (clearly I’m causing some science fiction) from all the cosplay characters, and there are some fantastic fan costumes and great guests, it’s time to beam me off this rock. I fire up the Millennium Falcon (the car) plot in the co-ordinates into the navicomputer (Sat-Nav) and head for home, the road’s all clear kid. See you next year.